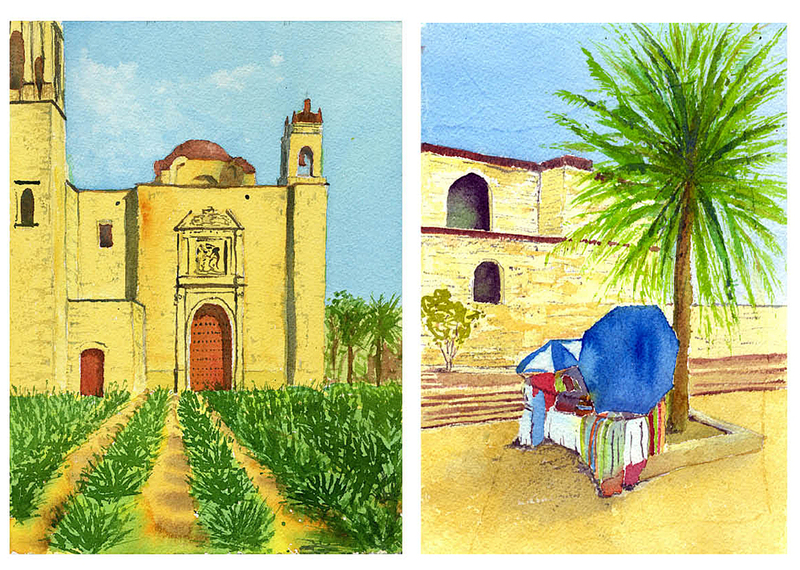 While I was in Oaxaca I tried to do a watercolor every day. I didn’t quite manage that, but I was quite prolific by my standards. Kind of fun, I’m hoping to continue maybe once a week throughout the year. 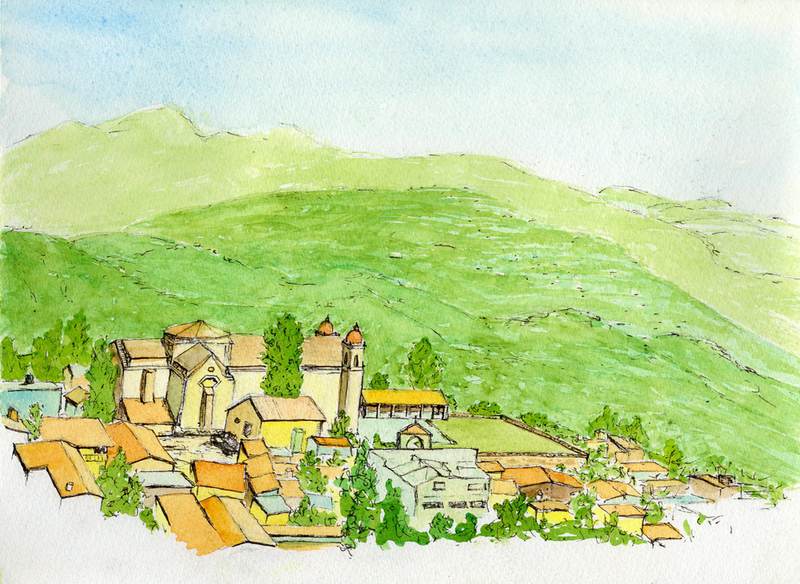 This isn’t every single watercolor I did — I did a few others that I’ll mix into my upcoming posts — but it gives a decent overview of my trip while I work on my more targeted posts. 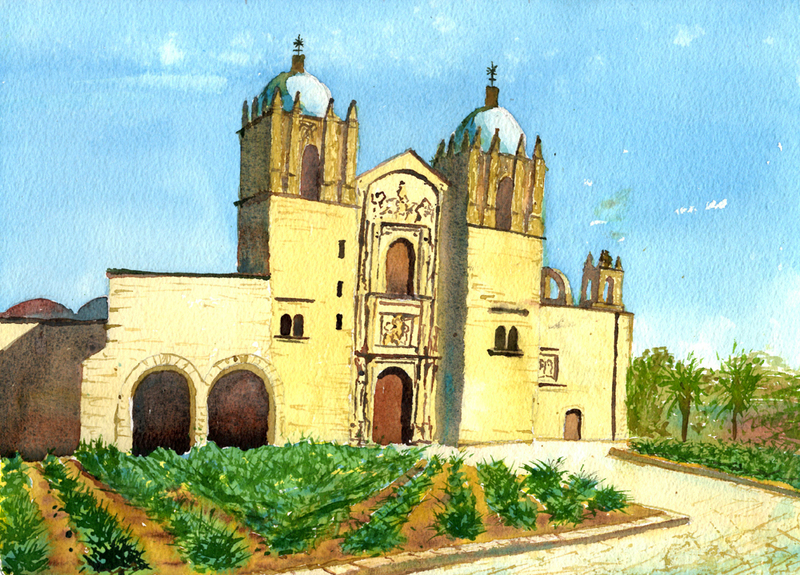 The first one is from the Oaxaca Ethnobotanical Garden in the center of town inside the walls of the historic cathedral complex. It’s a fantastic garden; I’ll do a post about it soon. The others show the main cathedral and a booth selling clothing near a side entrance. 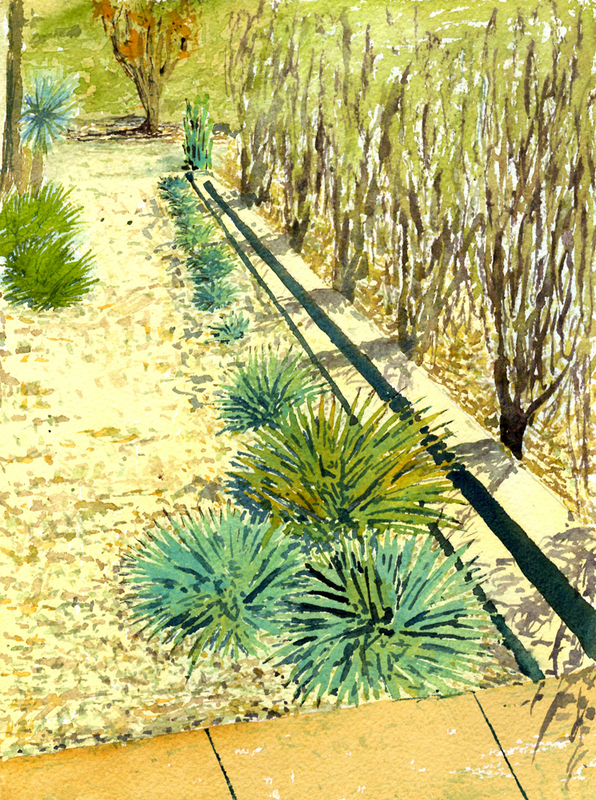 I painted a lot of agaves and palms while I was down there. 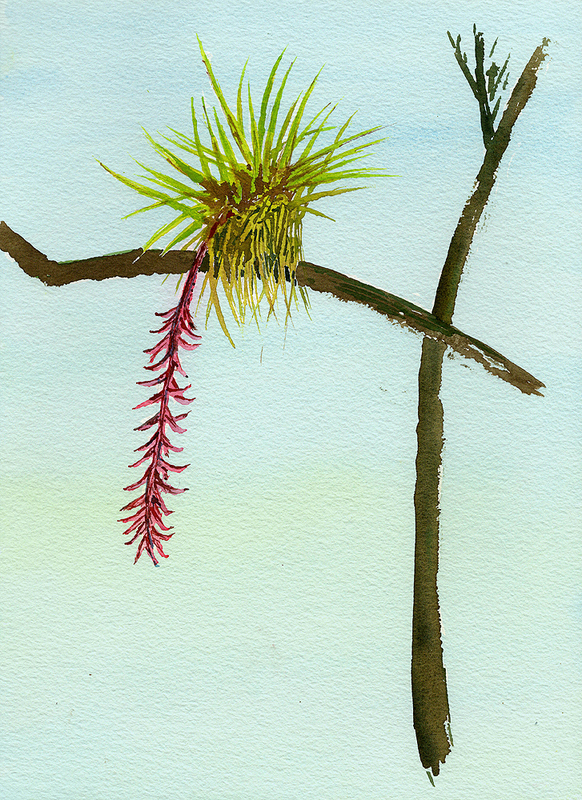 Gotta like agaves and palms if you’re going to watercolor in Oaxaca. 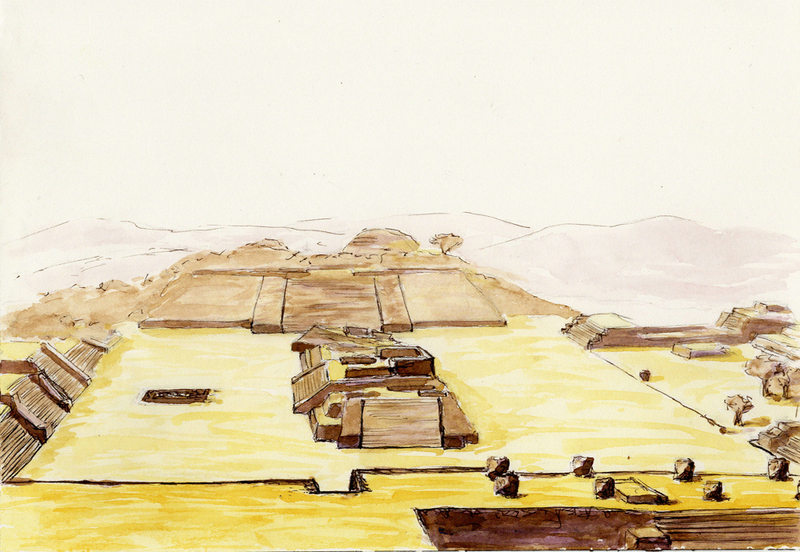 I also went to Monte Alban and Mitla, Oaxaca’s two best Zapotec archaeological sites. Beautiful stonework, I took many photos. Mitla has a Spanish church built onto the Zapotec ruins, a little like a giant carried one over from Spain and dropped it right on top. This one is adapted from the Zapotec symbol widely used throughout Oaxaca. Sometimes referred to as an earth serpent, the form also represents a temple and a mountain, both of which were sacred to the Zapotecs. 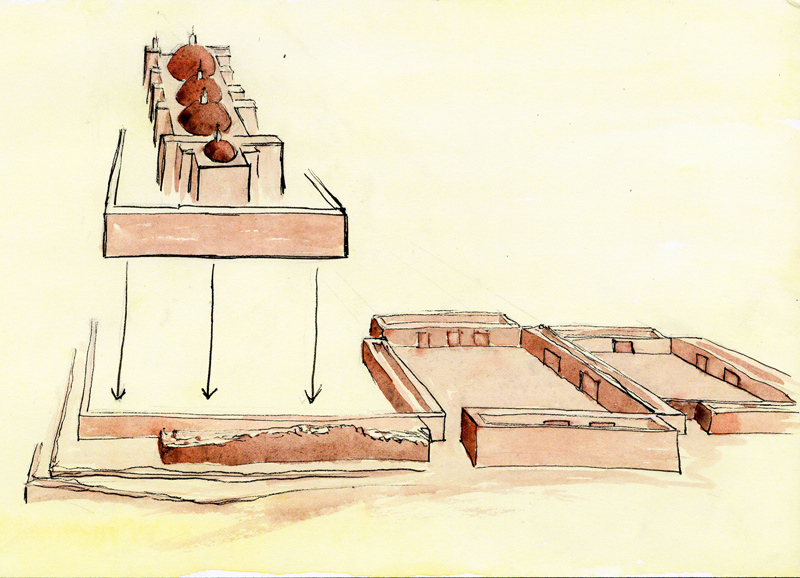 It’s like a section view of the exterior of a temple mixed with a plan view of its interior. 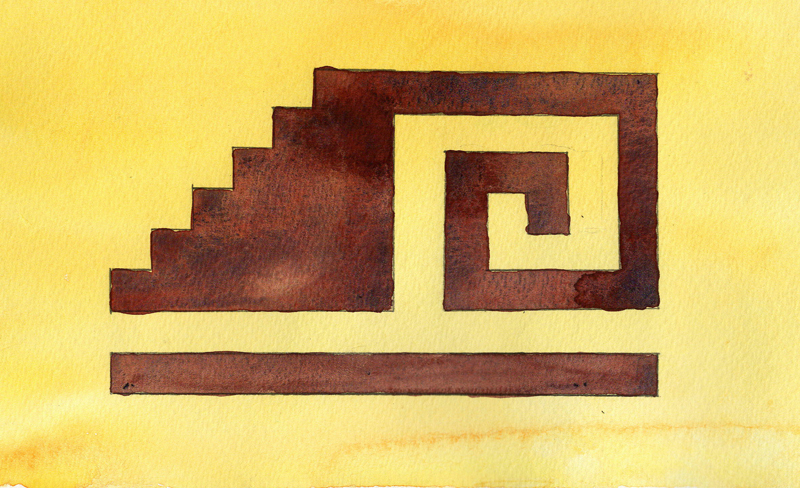 I like the way its spiral resembles the Maori’s koru symbol, but inspired by blocky masonry rather than a sinuous fern frond. My version is actually a simplified version of the carvings and mosaics at Mitla. The stone reliefs there blew me away and continue to blow me away every time I look at my photos. I’ll post photos of them before too long. I did some hiking from town to town in the hills above Oaxaca City in an area known as the Pueblos Mancomunados. One section of trail in particular was spectacular, with pre-hispanic stonework to admire and bromeliads flowering in the trees. That will probably be my next post. After some time in the highlands, I went down to the beach. 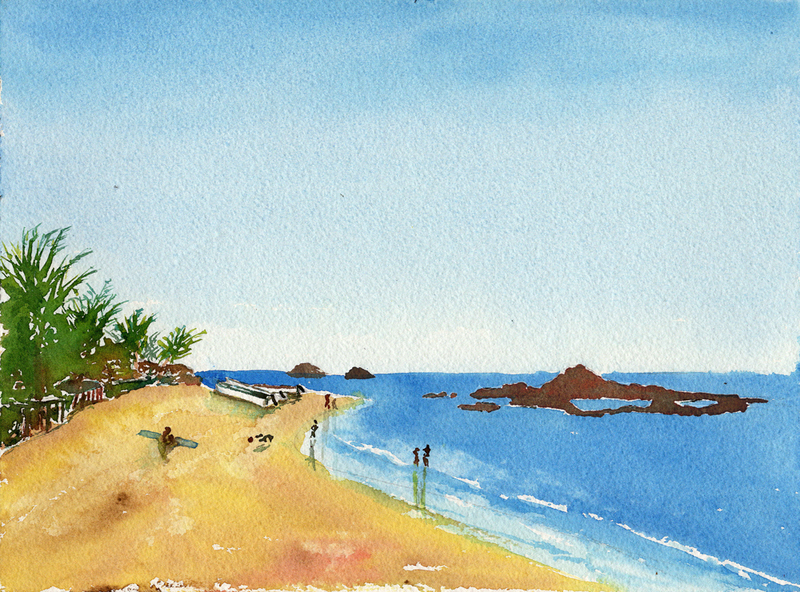 The coast there is beautiful, warm and friendly and suitably tropical for a January vacation. 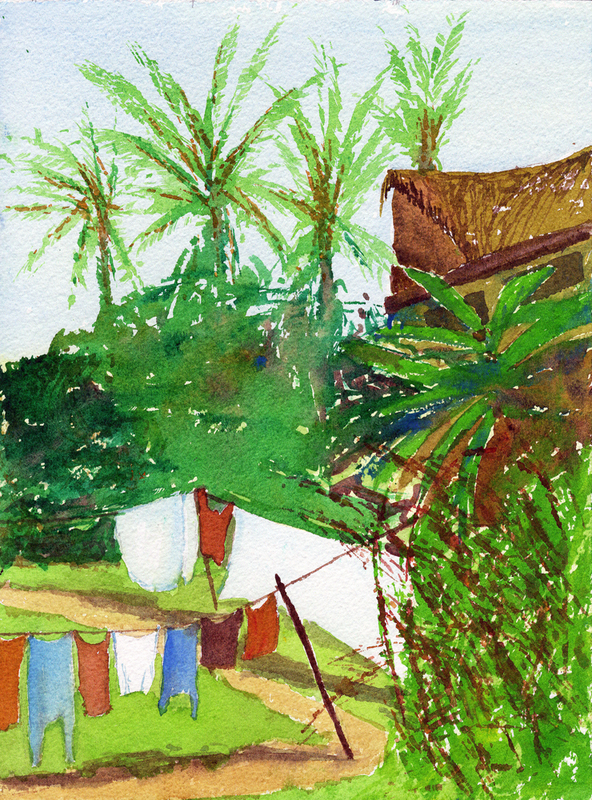 I made this watercolor of the town laundry in Mazunte. There was a sign boasting that everything was ‘Washed with Love’; I probably should have incorporated that into the painting. 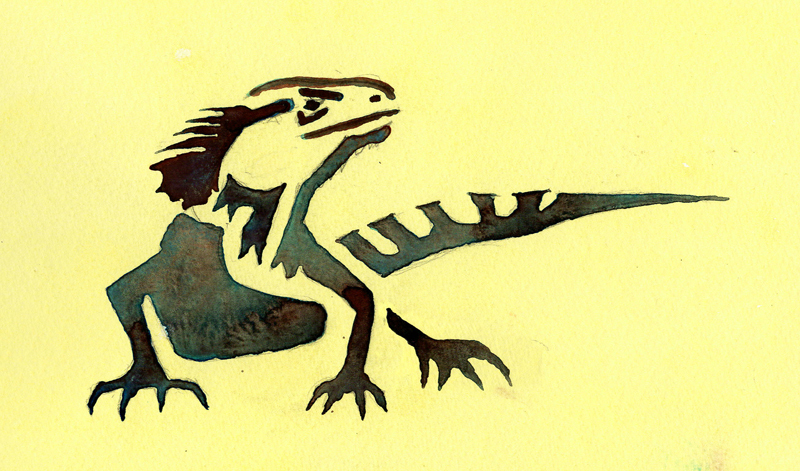 My hostel in Puerto Escondido was the domain of several iguanas which would periodically cruise through the open-air kitchen. Several times I heard claws on the roof and looked up expecting pigeons, only to see a malevolent-looking iguana instead. It’s intimidating to see a scowling iguana come climbing down the stairs while you’re sitting barefoot drinking your morning tea. These two are from neighboring San Augustinillo. 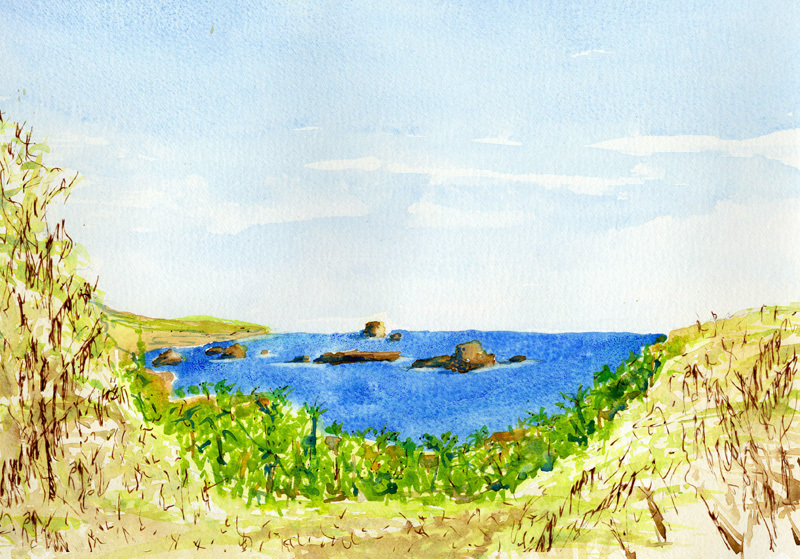 As you walk along the road from Mazunte, the landscape of dusty sun-baked scrub opens onto a view of the ocean surrounded by palms, sudden technicolor like when Dorothy opened her eyes on Oz, an experience I’ve found at most of Mexico’s beautiful places. They’re often surrounded by rather undistinguished areas and become more impactful as a result, an oasis effect; the drama is heightened by the drab surrounding scrubland. And it the end of the day, it is dramatic. Mexico Lindo. There are few things better than a Mexican beach oasis. This entry was posted on Monday, February 27th, 2017 at 7:34 am and is filed under sketchbook. You can follow any responses to this entry through the RSS 2.0 feed. You can leave a response, or trackback from your own site.